Come, check out our camps! Our unique system allows you to choose a week, day or just an afternoon! 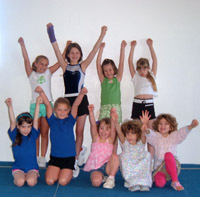 Each camp is themed to give your kids an opportunity to pick activities suited to their idea of fun. Themes such as a pirate on the Sea hoists their sails, swings across the bottomless ocean, to drop on the deck of another vessel!! Spiderman climbs a wall, jumps to a bar and swings on his adventure. All of this fun happens under the watchful eyes of our instructors. Arts and crafts abound in our camps. This is a whole experience your children will remember for a long time.